In February 1968, Di Mercer drove her trusty Mini-Moke up the rutted Coolgardie Road. On impulse she parked and scrambled through a barbed wire fence. She walked through the tangle of Kikuyu and lantana to the crest of the hill. She gasped with delight at the vista that opened up before her of sweeping cane fields, the Richmond River, Pimlico Island, and the brooding ocean. Perching on a large lichen-covered boulder, she began to dream. She kept dreaming of this patch of land, kept returning to it. Feeling like a trespasser, she set about exploring, clambering through thickets of lantana, over large rocks, down steep slopes. 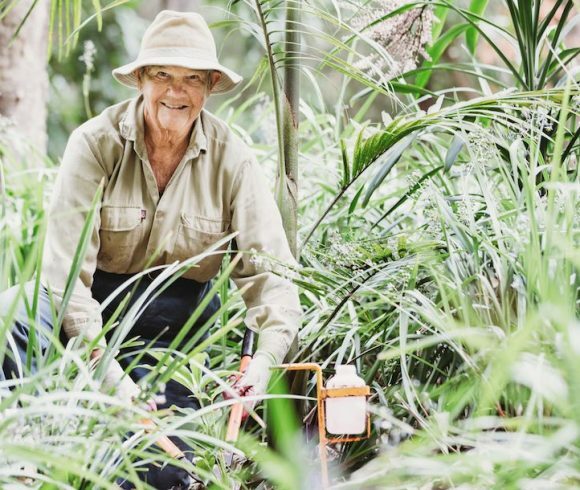 Her resolve to find a way to buy the land was made when she discovered several large waterfalls cascading over shining basalt rocks surrounded by slender Bangalow Palms, small rock orchids and stands of tall Hoop Pines. This land needed a steward – and she was the right woman for the job. Four years later she purchased 8.2 hectares and had a simple house built on the ridge. In 1972 she moved there with her two teenage daughters, naming the place ‘Crystal Hill’. Once there she revelled in growing vegies, building garden beds, chasing chooks and befriending the wallabies. Once her daughters left home she sold the Moke, happily riding the 14 kms into Ballina for provisions, to see friends, barter herbs, and visit the library. She spent her days planting trees, pulling weeds, and writing articles for magazines such as Earth Garden. She was the land’s steward, she was fulfilling her dream. Unfortunately, this all ended abruptly after only 6 years. In 1978 as she was cycling along the Pacific Highway she was struck from behind, dying instantly. 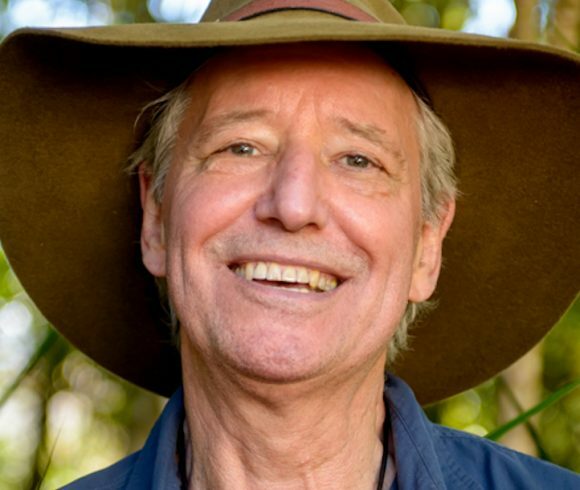 Having acquired the property, Di’s daughter, Steph, and husband, Jules (retreating from Sydney’s stresses), found themselves struggling through thickets of lantana, scrambling down scree slopes, getting bushed in the dense vegetation. They decided there must be a better way. Off to the Wollongbar TAFE they went, to learn about Bush Regeneration, how to control the weeds, how to encourage the native species to reclaim their rightful place. Over the next twenty years they battled with lantana and camphor laurels, hand-removed vast tracts of crofton weed and mist-flower from the waterfalls, all the while beset by ticks, leeches, jumping ants, and cane-toads! 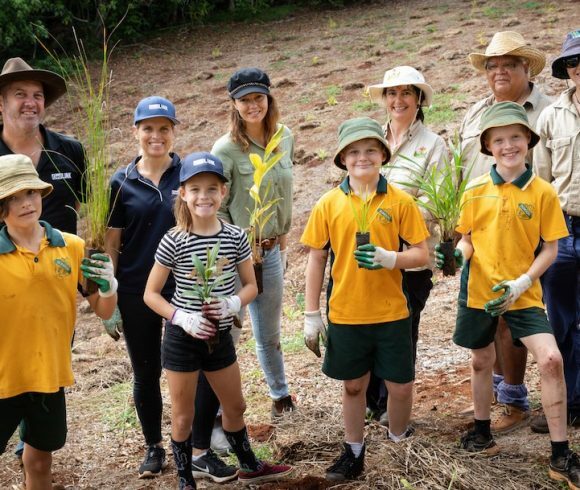 The fruits of their labours have been rewarded with many native rainforest species germinating, and animals such as the Wompoo Fruit Dove, the magnificent Richmond River Birdwing Butterfly, and Tawny Frogmouths returning. ‘Crystal Hill’ is now one of the Big Scrub remnants recognised for its heritage and conservation significance. 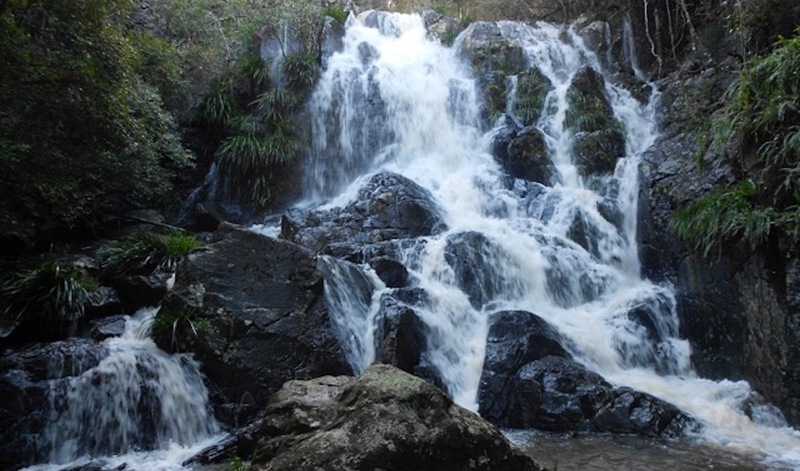 In 1998 they entered into a Voluntary Conservation Agreement (VCA) with NSW National Parks. This protects 7.3 hectares of the property in perpetuity. And so, fulfils Di’s dream of enduring stewardship.